Ample Clear Floor Space plays a vital role in achieving an effective, functional, accessible bathroom. 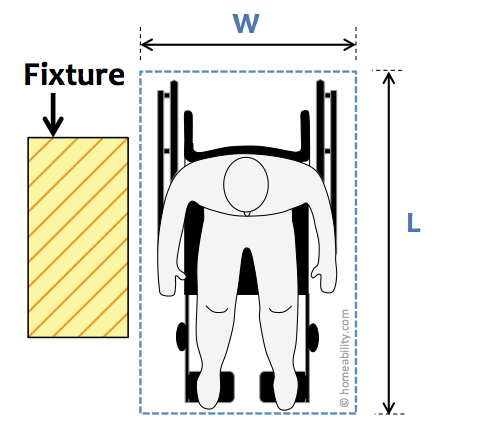 In this guide you’ll find the minimum Clear Floor Space dimensions required for meeting the needs of a standard manual wheelchair user (per US National Accessibility Standards). You will also find minimum recommended dimensions for meeting the needs of persons using larger mobility devices, such as electric wheelchairs, scooters, and reclining wheelchairs. 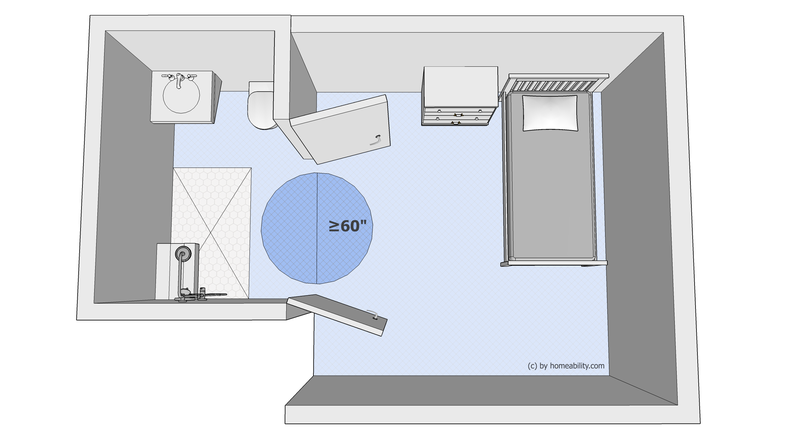 The Clear Floor Space dimensions identified in this guide should be viewed as the bare “minimum” design standards required to make a bathroom wheelchair accessible, not as the “ideal” design standards to make a bathroom accessible. Imagine for a moment that you are attempting to parallel park your car in a super tight parking space. This is essentially what it is like for persons using a wheeled mobility device to maneuver around inside spaces that just barely meets accessibility guidelines. Clearly, nobody who relies on a wheelchair wants to be forced to go through an experience equivalent to parking a car in a super tight parking space every time they need to use the bathroom! It is, therefore, always better to err on the side of including more clear floor space in the bathroom designs than too little clear floor space. When space allows, at a minimum, it is advisable to use the “preferred specs” identified below when designing a bathroom. In doing so, it will help to better ensure your home is inherently prepared to support everyone regardless of age, ability, or type of mobility aid used. There are some tricks at the end of this guide for how to enhance clear floor space, if needed. Be aware that if you are remodeling a living space for a wheelchair user and the architectural barriers do not permit meeting the minimum clear floor standards, it does not mean you should immediately cast aside the remodeling project as a lost cause. Some wheelchair users have smaller wheelchairs or are more adept at maneuvering their wheelchairs, which may allow them to eek by with less than the minimum recommended specifications identified below. The ability to make do with less space, needs to be determined on a case-by-case basis. Are there specific design standards for walker users? No. When designing a space for a walker user, it is important to be aware that walkers do not protect people when they are walking backwards, therefore at a minimum, the design plans should include enough clear floor space for a walker user to enter the bathroom, approach all bathroom fixtures, turn around, and exit the bathroom walking forwards. Designing the space to, at a minimum, meet manual wheelchair standards is a good baseline because by default, a space designed to accommodate use of a standard manual wheelchair will readily accommodate the use of most standard walkers and 4 wheel walkers (aka rollators). It also provides a walker user with the ability to easily transition to use of a wheelchair in the future, if needed. The layout & design specifications identified in this guide are intended for use as rough, general guidelines only. These guidelines will not be sufficient for meeting all individual’s needs. When modifying a privately owned home for an individual, it is important to always begin by measuring the size of the mobility device (occupied by the person), watching how the person maneuvers with it, and then creating the design plans to best fit the individual’s personal needs. ADA and ANSI Specs at Home? The abbreviations ADAAG (Americans with Disabilities Act Accessibility Guidelines), ADA (Americans With Disabilities Act) and ANSI (American National Standards Institute) are used throughout this guide. If you’re new to accessible design, you may wonder what ADAAG (“ADA”) and ANSI building standards are. They prescribe minimum design standards that legally must be adhered to when building places used by the general public to best ensure public places are accessible by all users, including persons with disabilities. Do you have to follow the ADA and ANSI design standards when adding accessibility features to a privately owned home? No. Normally they do not have to be followed at home, as they are meant for public spaces and businesses. A few exceptions may exist in cases where government funding is used for the home modifications. Even though it is not mandatory to follow the ADA and ANSI guidelines when adapting privately owned homes, they are still helpful to use as references when doing so. Keep in mind though that the ADA and ANSI guidelines identify parameters required to make public spaces accessible for the [majority] of persons who use manual wheelchairs, but they do not work for everyone. When you are designing or adapting a home for an individual, it is important to adjust the designs when and where needed to create a space suitable for the individual who will be using it (within the parameters of local building codes). FIGURE 1: Clear floor space adjacent to bathroom fixtures for “Forward Approach” (left) and “Parallel Approach” (right). For dimensions (W x L), see Table 1 above. For a sink, it is usually much more comfortable for a seated user to sit facing the sink with the feet positioned underneath. However, if space does not permit this, it is “possible” for a wheelchair user to park sideways beside a sink and use it. Keep in mind though that this will force a wheelchair user to always lean awkwardly sideways to perform all grooming and hygiene tasks at the sink. For a cabinet or closet, it is usually better for a wheelchair user to have space to pull up sideways beside the shelves because they can reach further into the closet and can access higher storage shelves inside. 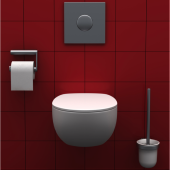 For a toilet, the best space for the clear floor space will depend on the type of transfer technique the user prefers. Many people need or prefer to transfer by parking their chair beside the toilet and sliding from the wheelchair seat sideways onto the toilet seat. Others need or prefer to pull up the front of the wheelchair to the front of the toilet from a specific angle (e.g., frontally or at a 90 degree angle), then perform a stand-pivot turn from the wheelchair seat to the toilet seat. The key take-away here is that it’s important to understand the type of fixture the clear floor space is optimized for, as well as the needs of the user, prior to selecting how/where the clear floor space will be oriented adjacent to each fixture. FIGURE 3: Clear Floor Space By Door Latch for “Front Approach”. For dimensions X and Y of the required clear floor space, refer to the following table (Table 2). TABLE 2: Clear floor space by door latch for Front Approach. FIGURE 4: Clear Floor Space By Door Latch for “Hinge-Side Approach”. 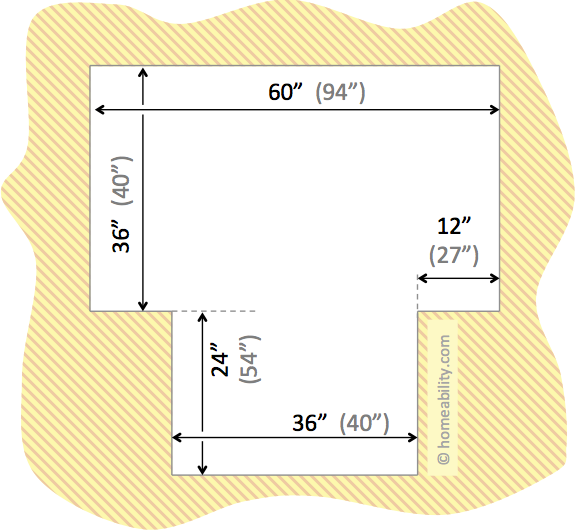 For dimensions X and Y of the required clear floor space, refer to the following table (Table 3). TABLE 3: Clear floor space by door latch for Hinge-Side Approach. Either, include enough space to accommodate a 360-degree Turning Circle (the easiest means of turning around). Or, if there is not enough room for a circular space, provide a T-shaped Turning Space. 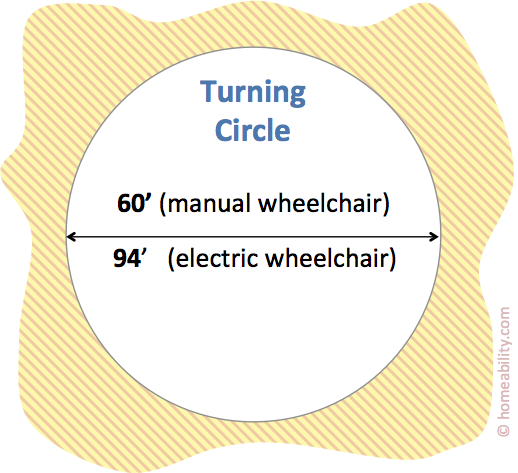 FIGURE 5: 360-Degree Turning Space (or “Turning Circle”). Only minimum diameters for standard manual wheelchairs and electric wheelchairs are shown; see the following Table for a complete overview. 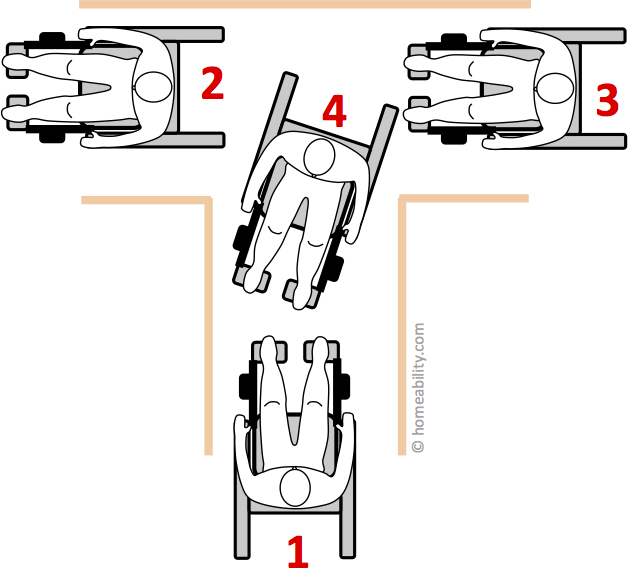 FIGURE 6: U-Turn in 4 Steps using T-shaped Turning Space. FIGURE 7: T-shaped Turning Space. 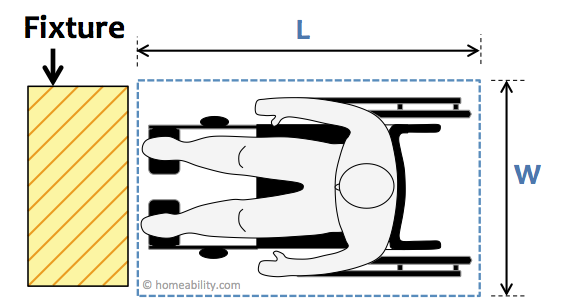 Dimensions in black are minimums for manual wheelchairs, dimensions in gray are minimums for electric wheelchairs, scooters, and reclining wheelchairs. See Table 5 for more details. minimum dimensions The T-shaped space should reside within a 60″ square minimum with arms and base 36″ wide (ADA/ANSI) The T-shaped space should reside within a 94″ square minimum with arms and base minimum 40″ wide. TABLE 5: Minimum and preferred dimensions of a T-shaped Turning Space. If you’re designing a new bathroom from scratch, make sure to include sufficient space to allow a full 360 degree turn, ideally by providing a circular turning space. 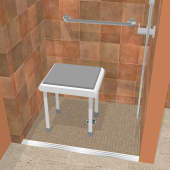 If you’re remodeling an existing small bathroom, it may be challenging or even impossible to include enough clear floor space for allowing a person to turn around inside the bathroom with their walker or wheelchair. In this case, at the very least try to incorporate as much floor space as possible by using the section “Tips and Tricks to Increase Clear Floor Space” found below. 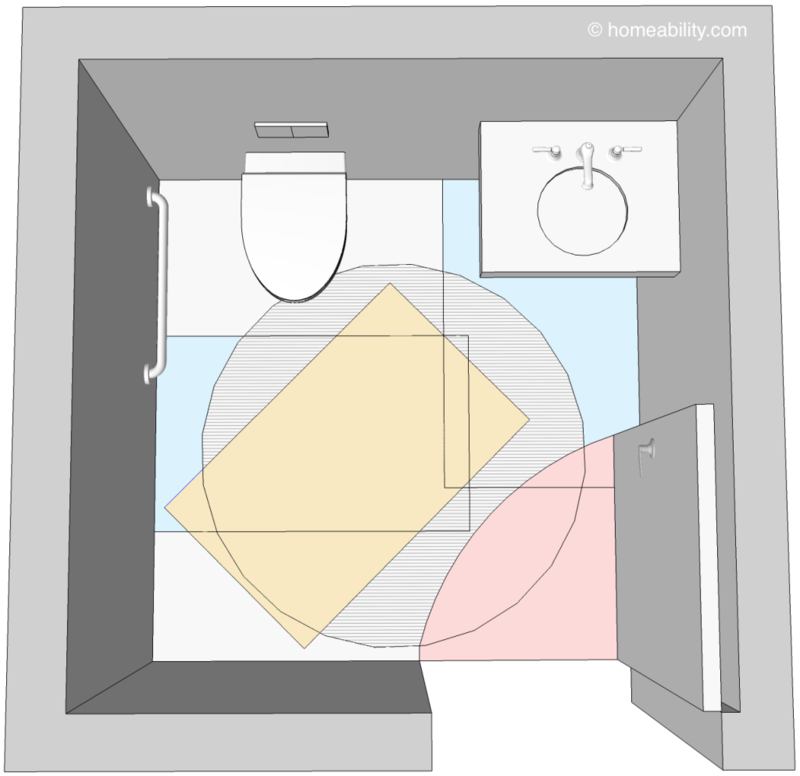 FIGURE 8: Overlapping Floor Space in an Accessible Bathroom. The Clear Floor Space that’s required adjacent to each bathroom fixture (e.g. 30” x 48”) can overlap with one another. 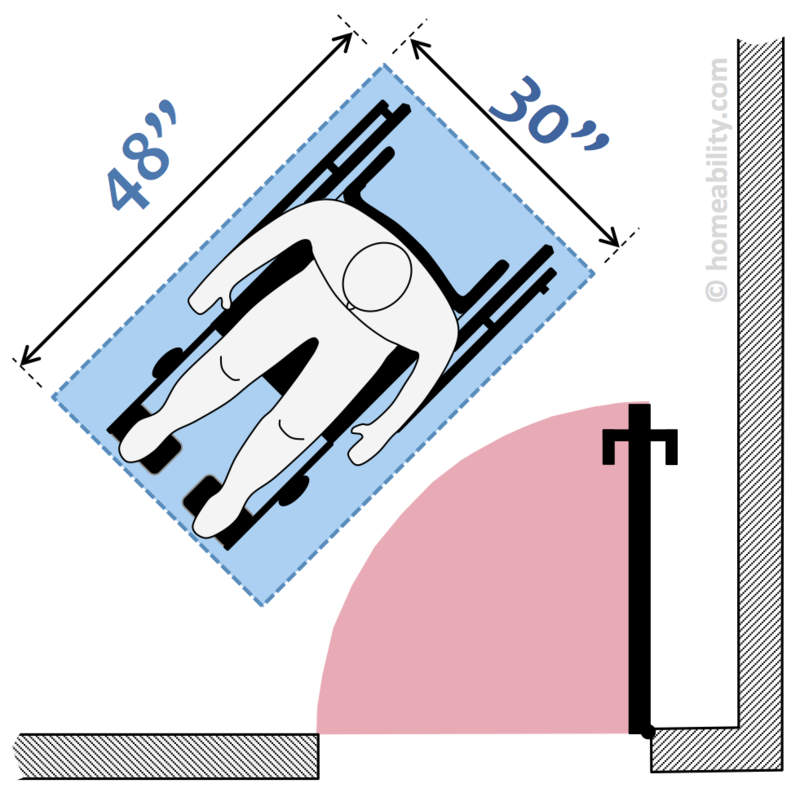 In the illustration, the floor space rectangles assigned to the toilet and sink, each subtly indicated with partial blue shading, overlap with each other. The 360 Degree Turning Circle (gray disc in the illustration) or T-shaped Turning Space (not shown here) may overlap with the door swing (red-shaded quarter-circle). The Clear Floor Space by the door (yellow-shaded rectangle) may overlap with the Clear Floor Spaces by the fixtures and/or the Turning Space. 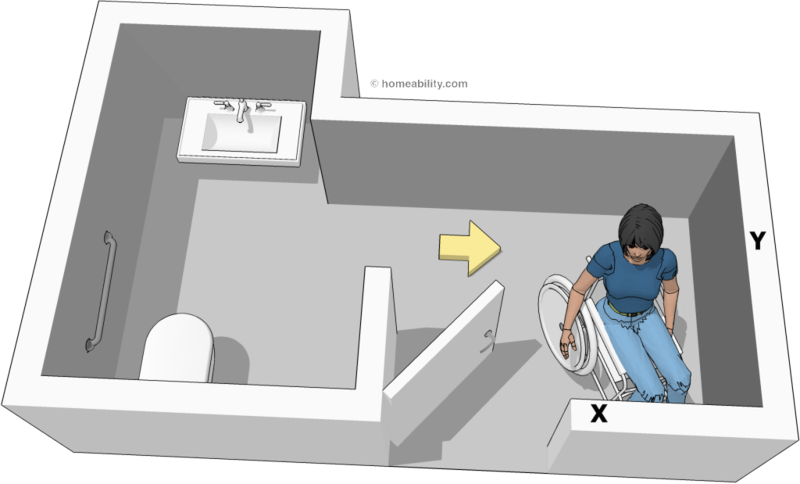 A toilet and sink may also overlap the Turning Space if there is adequate space for the wheelchair user’s footrests and/or knees to pass underneath – e.g., owing to a wall-hung sink or wall-hung toilet. 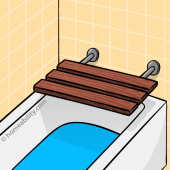 In the illustration, the Turning Circle is slightly overlapping with the front tip of the toilet, assuming some free space under a suitable toilet type. However, under no circumstances should the Clear Floor Space by the door (yellow shaded rectangle) overlap with the (red-shaded) door swing. As explained above, that would prevent the bathroom user from closing and opening the door and from parking the mobility aid inside the room. Wall-Hung Sink: Installing a wall-hung sink can increase clear floor space for a wheelchair user by up to 25-30 inches. A wheelchair user’s legs and the wheelchair’s leg rests can pass underneath the sink, allowing them to benefit from the open floor space below the sink when turning around inside the bathroom. 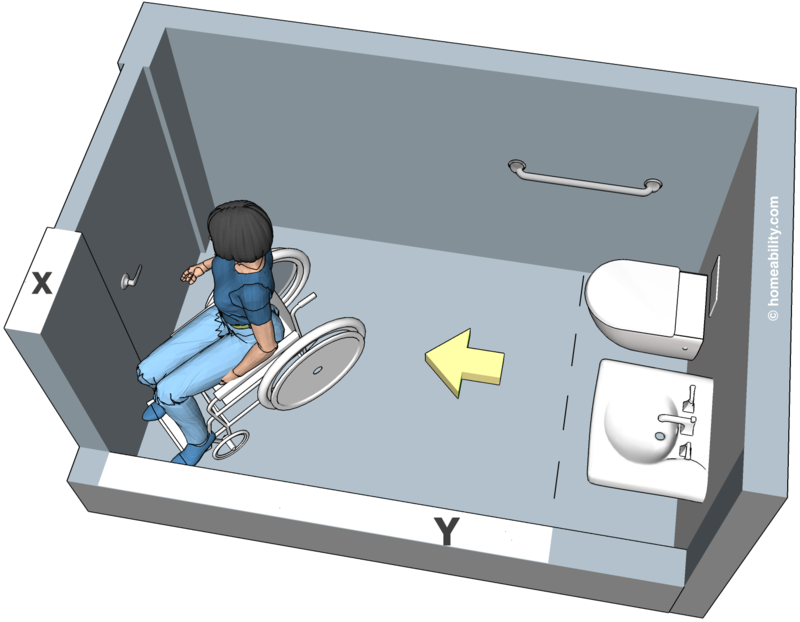 Wall-Mounted Toilet: Selecting a wall-hung toilet model with the tank portion stored inside the bathroom wall can increase usable floor space for a walker or wheelchair user by approximately 10-12 inches, depending on the toilet model. A wall-mounted toilet can also allow a wheelchair’s footrests to pass underneath the bowl, thereby increasing usable clear floor space for a wheelchair user by approximately another 6 inches. Be aware that some wheelchairs have elevated leg rests, so not all wheelchair users will be able to benefit from the extra space available “underneath” the toilet. Toe Kick: Install the vanity and cupboards with a toe kick that’s a minimum of 9” above the floor and 6″ deep. This can increase clear floor space for a wheelchair user by as much as 6” by making it possible for the footrests to pass underneath the cabinets. Be aware that wheelchair users who have elevated leg rests will not be able to benefit from the extra space available “underneath” the cabinet. 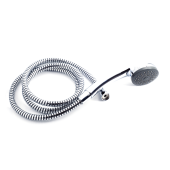 Curbless Shower: If a curbless (zero threshold) shower is provided, the shower floor can be exploited as “turning space” by a person using a walker, rollator, or wheelchair, making it easier to move and turn around inside the bathroom. Reverse Door Swing: Reversing the bathroom door so it swings out into the hallway, or installing a pocket door, can increase clear floor space inside the bathroom for a person using a mobility aid by as much as 26-36 inches depending on the bathroom door’s width. Automatic Door Opener: If you are truly pressed for space, installing an electric door opener can be a potential substitute for providing the 18” (or more) of clear floor space adjacent to the door handle that a wheelchair user requires to be able to reach the door handle and lock. “If” space allows, however, it is always best practice to include clear floor space beside the door handle, so the door can be opened manually in the event the automatic door opener fails. FIGURE 9: By opening up the walls between bathroom and adjacent bedroom and installing double doors, the usable clear floor space of a small bathroom can be substantially increased. 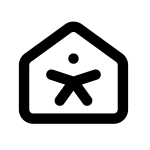 (This illustration is an example only. Many variations are possible.). 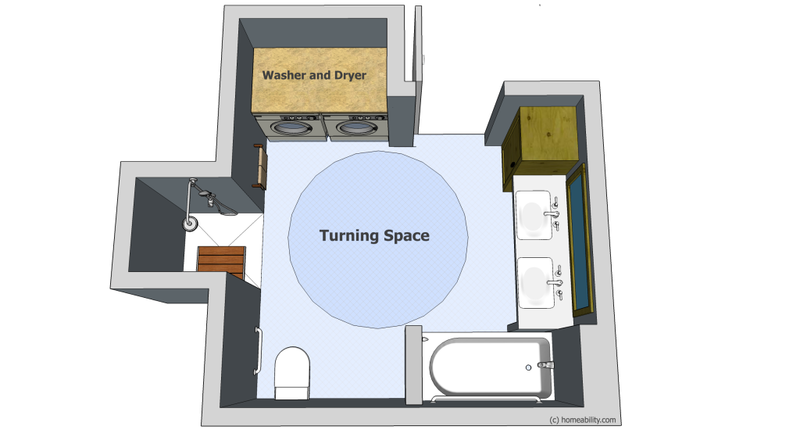 FIGURE 10: Combining bathroom and laundry room to gain precious clear floor space. What are the consequences of insufficient clear floor space? Person Must Exit Backwards! If a person can enter the bathroom using a walker or wheelchair, but can not turn around when inside, then they’ll be forced to exit the bathroom moving backwards. It is neither easy (nor safe) for a person using a walker to walk backwards out of a room, nor is it easy for a person using a wheelchair to try to open and close a bathroom door when it’s positioned behind them. No Privacy! If there isn’t enough clear floor space to allow the bathroom door to swing closed while the walker or wheelchair is positioned inside, then the person will be forced to use the toilet, bathtub, or shower with the bathroom door wide open. Can’t Use the Bathroom at All! If the clear floor space present between the bathroom fixtures and/or bathroom walls is too narrow, a person using a walker or wheelchair won’t be able to pass through. Hence, they would be blocked from accessing the toilet, sink, or shower…and consequently relegated to using a portable-style bedside potty (that they have to ask someone else to empty) and to taking sponge baths at the kitchen sink. Obviously none of the above scenarios is ideal, so the more clear floor space you include in the design plans the better. It is always preferable to overshoot in providing floor space – than undershoot … and end up being unable to use the bathroom altogether!